Shirts With Random Triangles: Texas Adds Four-Star OT Prospect Jean Delance To Its 2016 Recruiting Class. 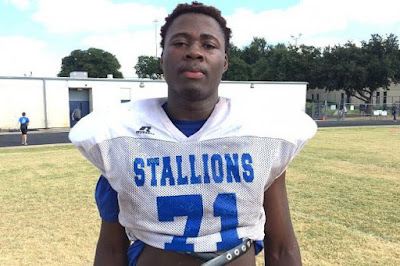 Texas Adds Four-Star OT Prospect Jean Delance To Its 2016 Recruiting Class. Jean Delance. Image via Bleacher Report. Texas added the 13th member of its 2016 recruiting class on Saturday. Mesquite, Tx. high school senior offensive tackle Jean Delance announced his commitment to the Longhorns during the 2016 Under Armour All-America Game at the Orlando Citrus Bowl in Orlando, Fl. Delance had previously committed to Oklahoma, but decommitted following a video showing white members of University of Oklahoma fraternity participating in a chant that included use of a racial slur and a reference to lynching. 247Sports grades Delance as a composite four-star offensive tackle prospect. The recruiting site ranks Delance at no. 10 among 2016 OT prospects, at no. 15 among 2016 prospects from the state of Texas, and at 90 in its composite national rankings of 2016 prospects. Delance attends North Mesquite High School in Mesquite, Tx. He stands 6'5, and weighs 291 lbs.